Some colleagues and I successfully proposed for a symposium session on citizen science at the annual meeting of the American Association for the Advancement of Science (AAAS) in San Jose, CA in February 2015. (The AAAS is the world’s largest scientific society and is the publisher of the Science journal.) Our session will be titled “Citizen Science from the Zooniverse: Cutting-Edge Research with 1 Million Scientists.” It refers to the more than one million volunteers participating in a variety of citizen science projects. This milestone was reached in February, and the Guardian and other news outlets reported on it. As we all know, the Zooniverse began with Galaxy Zoo, which recently celebrated its seventh anniversary. Galaxy Zoo has been very successful, and it led to the development of a variety of citizen science projects coordinated by the Zooniverse in diverse fields such as biology, zoology, climate science, medicine, and astronomy. Most of you are familiar with many of them, and the projects include, for example: Snapshot Serengeti, where people classify different animals caught in millions of camera trap images; Cell Slider, where they classify images of cancerous and ordinary cells and contribute to cancer research; Old Weather, where participants transcribe weather data from log books of Arctic exploration and research ships at sea between 1850 and 1950, thus contributing to climate model projections; and Whale FM, where they categorize the recorded sounds made by killer and pilot whales. And of course, in addition to Galaxy Zoo, there are numerous astronomy-related projects, such as Disk Detective, Planet Hunters, the Milky Way Project, and Space Warps. We’re confirming the speakers for our AAAS session now, and the plan is to have six speakers from the US and UK who will introduce and present results from the Zooniverse, Galaxy Zoo, Snapshot Serengeti, Old Weather, Cell Slider, and Space Warps. I’m sure it will be exciting and we’re all looking forward to it! I’m also looking forward to the meeting of the Citizen Science Association, which will be a “pre-conference” preceding the AAAS meeting. 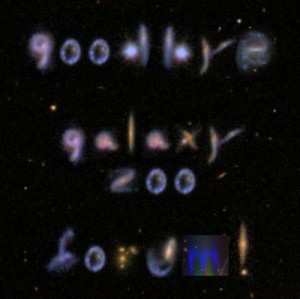 Today marks the end of an era for the Zooniverse: the closure of the Galaxy Zoo forum. Read all about it on the Zooniverse blog. After very nearly seven years online, and over 650,000 posts by its members, the time has come to shut the doors on the original Galaxy Zoo Forum. Originally an afterthought, created to deal with the fact that we couldn’t possibly deal with the volume of mail that we were getting, the Forum quickly established itself as a very special place. It generated science – the Voorwerp and its diminutive colleagues, the Voorwerpjes, the Peas and much more came from discussions amongst its boards, as well as such random fun things as the letters that power My Galaxies. Here at Zooniverse we’re starting some exciting new work in the humanities! We’re pleased to announce our new collaboration with Tate Britain, a world-leading institute for art in the modern era, based in London. Zooniverse and Tate are teaming up to tackle the difficult task of crowd-powered full-text manuscript transcription. This project follows on from the success of projects like Operation War Diary and Old Weather and will no doubt feed into other humanities projects in the future. The new transcription interface will enable volunteers to read and transcribe the personal papers of modern British artists. Volunteers will encounter letters, notebooks and sketches that reveal artists’ everyday lives, creative practices and the processes by which great works of art were made. We are seeking a talented front end developer with a passion for art and the humanities to work alongside our humanities specialist and the Zooniverse and Tate teams to deliver the project. PS: We are also looking for a new web developer to join our team at the Adler Planetarium in Chicago. You can view the job description here. 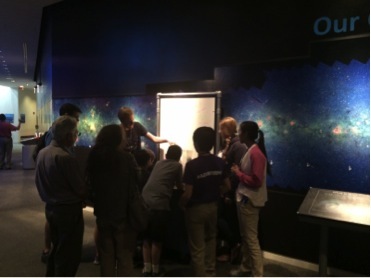 Today’s guest post comes from Jesse Feddersen and Rachel Wolf about their experience developing a citizen science themed floor experience at the Adler Planetarium as part of the summer school sponsored by the University of Chicago’s Kavli Institute for Cosmological Physics. Jesse Feddersen is a PhD student in the Astronomy department at Yale University. He is especially interested in observational studies of galaxy evolution. He believes scientists have a responsibility to actively engage in public outreach, and it’s fun too! When he’s not doing science or outreach, Jesse enjoys hiking, baking, and singing songs from Frozen. Do you want to build a snowman with him? Rachel Wolf is a PhD student in the Physics and Astronomy department at the University of Pennsylvania. Her research focuses on observational cosmology using Type Ia supernovae. She loves sharing science with the public and is especially passionate about getting kids excited about science! In her spare time, she loves to cook, host game nights, and cheer for her UCLA Bruins! The sentiment of one precocious little girl perfectly reflects our philosophy: everyone can be a scientist, and through Zooniverse and other citizen science projects, contribute to research projects in the fields they find most exciting. We came to Chicago for a summer school sponsored by the University of Chicago’s Kavli Institute for Cosmological Physics. This two week program was designed for graduate students in astronomy and physics who are interested in education and public outreach and partnered them with teams at the University and Adler Planetarium. We chose to work with the Zooniverse team at Adler. On our first day at the planetarium, we met with Laura and the citizen science team and situated ourselves in Zooniverse HQ. This felt a little like meeting the Wizard of Oz, or getting a backstage pass to a Queen concert. We soon realized that to planetarium guests, the Zooniverse presence at Adler was confined to a room hidden away in a dark corner at the end of a hallway. There were few exhibits or demonstrations explaining what the Zooniverse is and how to get involved. It seemed like a great starting point for increasing exposure was to create an interactive activity introducing planetarium guests to the Zooniverse. Early on, we decided to tailor our demonstration to elementary school kids and their families. We spent some time looking through the various Zooniverse projects and thought, “We could teach about galaxy formation! We could teach about magnetic fields and solar activity! We could look for cute pictures of baby elephants all week!” The more we brainstormed the more we realized why we were so excited. Sure, images of space are mesmerizing and everyone loves baby elephants, but we were also just really curious about these things. As astronomers, it’s our job to be curious and to figure out new things. But science is certainly not limited to people like us – it’s for everyone! That’s when we decided our activity should get at the core of the Zooniverse and demonstrate just how everyone can be a scientist. We knew we wanted to emphasize key components of citizen science projects, like observation and collaboration, but we weren’t sure how to integrate these ideas into an activity that would attract a sugar-buzzed eight year old. Our hook had to be exciting and offer guests a unique “I’m in a space museum” experience. After much thought, an idea finally hit us: how cool would it be if we had a meteorite small enough for guests to hold? From there, our activity almost designed itself(even though we had yet to confirm the existence of said meteorite). After discussing our first draft with Laura and Julie and making a few changes, we had a solid outline of what we wanted to do. “Mystery Rocks” was born! Step 2: Make some observations. At this point, we offer our rocks to the guests and encourage them to make observations using the tools available (magnifying glass, magnet, etc). After a few minutes, we ask guests to shout out their observations as we write them on a whiteboard for everyone to see. Step 3: Classify the objects and vote. We then group the rocks based on the observations (e.g. rough v. smooth, heavy v. light, magnetic v. non-magnetic) and have guests vote on the classifications. Our goal was to make this part of the activity tactile. After rummaging through the supply cabinets of the public programs department, we found some clear plastic graduated cylinders and large, colorful, fuzzy pom-poms that we thought would do the trick. For each classification, we use the pom-poms as our “ballots” and the graduated cylinders as our “ballot boxes” and have each participant cast his or her vote in a different box. After determining the group consensus, we write the classifications of the rocks on the whiteboard. Step 4: We just did science! Here is our chance to emphasize how everything we just did in the activity is precisely how science works. We then introduce the idea of citizen science and talk about the Zooniverse. Step 5: Use the voting results to learn about the rocks. Hopefully we still have the group’s attention and can discuss how to use our classifications to learn about the rocks. We ask the group if they can tell us where the rocks came from and then blow them away with the fact that they are actually holding a rock from space! Here’s the initial set-up of “Mystery Rocks” (first image) and a mid-activity shot of the whiteboard full of observations (second image). We tried to write down everything the crowd observed! We took two big lessons from this first demo. The first was that kids love distractions, and we provided them many by having lots of clutter on the activity cart. The second was that kids love pom-poms and stickers, and having these props helps to keep their interest. Surprisingly for us, most kids were not very impressed when we told them they were holding a meteorite, but were more interested in making observations about the rocks. We would never have come to these realizations ourselves, and we learned just how invaluable it is to actually test an activity, even if it is still rough around the edges. Using our experience on the floor as a guide, we changed our procedure to make “Mystery Rocks” more effective. We tested the activity with Adler’s Education and Public Programs department, as well as their teen interns. We got some excellent critiques about our hook and how best to communicate concepts of citizen science. 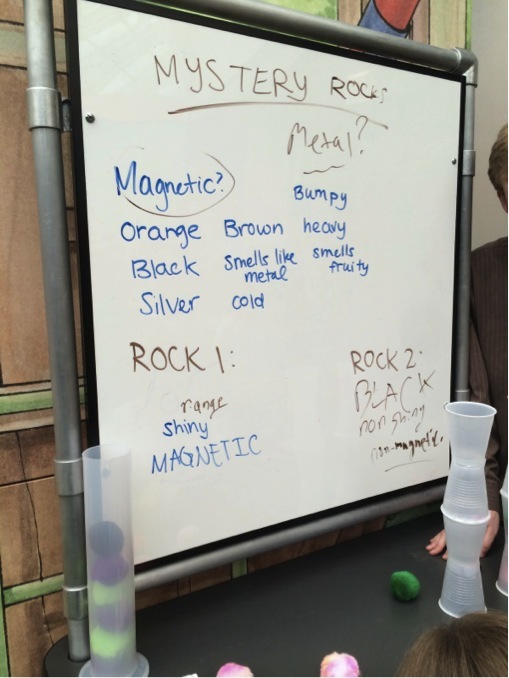 We also learned the requirements for floor programs and documented “Mystery Rocks” for future use at Adler and beyond. Keeping all the feedback in mind, we took the floor again, ready to excite planetarium visitors about citizen science! “Mystery Rocks” by the beautiful Milky Way panorama just around the corner from Zooniverse HQ. This gave us an excellent opportunity to talk about Galaxy Zoo! We’ll just have to work on that another time. We would like to thank Laura and Julie for all of their guidance and support as we developed our activity! We learned so much from you and had such a great team working with the Zooniverse team! The Constructing Scientific Communities project (ConSciCom), part of the AHRC’s ‘Science in Culture’ theme, is inviting proposals for citizen science or citizen humanities projects to be developed as part of the Zooniverse platform. ConSciCom examines citizen science in the 19th and 21st centuries, contrasting and reflecting on engagement with distributed communities of amateur researchers in both the historical record and in contemporary practice. Between one and four successful projects will be selected from responses to this call, and will be developed and hosted by the Zooniverse in association with the applications. We hope to include both scientific and historical projects; those writing proposals should review the existing range of Zooniverse projects which include not only classification, but also transcription projects. Please note, however, ConSciCom cannot distribute funds nor support imaging or other digitization in support of the project. Merit and usefulness of the data expected to result from the project. Novelty of the problem; projects which require extending the capability of the Zooniverse platform or serve as case studies for crowdsourcing in new areas or in new ways are welcome. Have a significant historical dimension, especially in relation to the history of science. Involve the transcription of text, either in its entirety or for rich metadata. Note it is anticipated that some, but not necessarily all selected projects, will meet this third criterion; please do submit proposals on other topics.